MK Dons scored two late goals to complete a remarkable late comeback and defeat League Two Leyton Orient in the first round of the League Cup. Orient had a first-half lead when Dean Lewington mis-kicked Dean Cox's cross and debutant keeper Cody Cropper's slip prevented him keeping the ball out. MK looked to be going out, but with the game nearing full-time Orient defender Mathieu Baudry headed into his own net. In the 92nd minute, Simon Church laid off Carl Baker to slot in for victory. 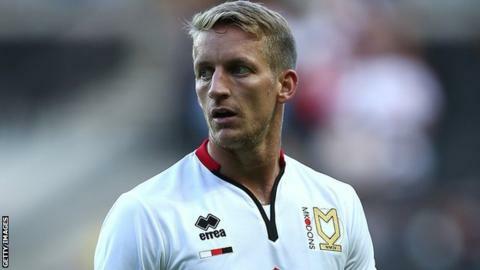 MK Dons boss Karl Robinson had made 10 changes to the side who beat Rotherham 4-1 on Saturday, and struggled to create any clear chances until late on in the game. Orient should have put the game to bed earlier as Ollie Palmer hit the post, with the ball bouncing to safety off Cropper. Orient forward Jay Simpson had a great chance with four minutes left, but United States Under-23 goalkeeper Cropper was equal to his effort. The result means the Dons - who humbled Manchester United in the competition last season - have reached the second round for the sixth year running. MK Dons boss Karl Robinson speaks to BBC Three Counties Radio following the 2-1 win against Leyton Orient. "I think Leyton Orient deserve an awful lot of credit for what they did and they deserved to get more out of the game than they did. We weren't great but when you make 10 changes you are going to get that in periods of the game. "The players' grit and determination was the pleasing thing for me and that never-say-die attitude. "I thought Carl Baker's goal was excellent and I thought Matthew Upson really showed his class." Match ends, MK Dons 2, Leyton Orient 1. Second Half ends, MK Dons 2, Leyton Orient 1. Attempt saved. Sam Gallagher (MK Dons) left footed shot from the centre of the box is saved in the top right corner. Goal! MK Dons 2, Leyton Orient 1. Carl Baker (MK Dons) left footed shot from the left side of the box to the bottom right corner. Own Goal by Mathieu Baudry, Leyton Orient. MK Dons 1, Leyton Orient 1. Attempt missed. Simon Church (MK Dons) header from the centre of the box misses to the right. Attempt missed. Mathieu Baudry (Leyton Orient) right footed shot from the right side of the box is close, but misses to the right. Corner, Leyton Orient. Conceded by Carl Baker. Corner, Leyton Orient. Conceded by Cody Cropper. Attempt saved. Jay Simpson (Leyton Orient) left footed shot from the centre of the box is saved in the bottom right corner. Substitution, Leyton Orient. Frazer Shaw replaces Alan Dunne. Substitution, Leyton Orient. Jay Simpson replaces Ollie Palmer. Substitution, MK Dons. Kyle McFadzean replaces Matt Upson. Substitution, MK Dons. Sam Gallagher replaces Cristian Benavente. Attempt missed. Mathieu Baudry (Leyton Orient) header from the centre of the box is close, but misses to the left following a corner. Corner, Leyton Orient. Conceded by Matt Upson. Corner, Leyton Orient. Conceded by Ben Reeves. Attempt saved. Ben Reeves (MK Dons) left footed shot from outside the box is saved in the centre of the goal. Mathieu Baudry (Leyton Orient) is shown the yellow card for a bad foul. Attempt missed. Alan Dunne (Leyton Orient) right footed shot from long range on the left is close, but misses to the left. Substitution, MK Dons. Ben Reeves replaces Dale Jennings. Attempt saved. Ollie Palmer (Leyton Orient) right footed shot from the centre of the box is saved in the centre of the goal. Cristian Benavente (MK Dons) wins a free kick in the defensive half. Corner, MK Dons. Conceded by Sean Clohessy. Attempt saved. Mathieu Baudry (Leyton Orient) header from the left side of the box is saved in the centre of the goal.